Some of the best birding in the United States is in the Chiricahua Mountains, Portal, and at Cave Creek Ranch. According to Richard Cachor Taylor’s Location Checklist to the Birds of the Chiricahua Mountains, “…the Chiricahua checklist presently stands at 375 species, not including 13 species still considered hypothetical — about half of all the birds regularly occurring on this continent north of Mexico.”This area is the most biodiverse landmass on the continent of North America, and the bird life reflects that. Cave Creek Canyon is the largest and best watered canyon in the Chiricahuas, and Cave Creek Ranch sits in the mouth of the canyon. As Rick Taylor says in his book Location Checklist to the Birds of the Chiricahua Mountains, “Geographical position accounts for much of the bird wealth of the Chiricahua Mountain Region. The Chiricahuas are situated near the North American apex of the 1000-mile-long cordillera of the Sierra Madre Occidental, and midway between the Sonoran and Chihuahuan Deserts. Draining the southeast corner of the range, the San Bernardino Valley spills into the Rio Yaqui and provides a 400-mile-long natural corridor for Sinaloan Thorn Forest birds”. The communities Rick mentions above are Desert, Grassland, Pinyon-Juniper Woodland, Sierra Madrean Pine-Oak Woodland, Ponderosa Pine Forest, and Fir-Spruce Forest. 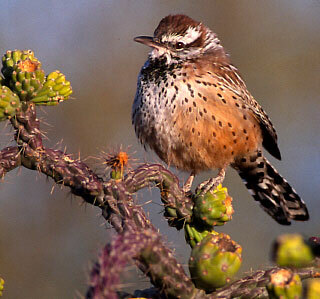 The desert scrub and grasslands provide homes for birds such as the Gambel’s Quail, the Cactus Wren, the Verdin and the Curve-billed Thrasher—residents of both the Chihuahuan and Sonoran Deserts. The forested slopes serve up accommodations for species as diverse as the Western Screech-Owl, the Virginia Warbler, Scott’s Oriole, the Hairy Woodpecker, the Sulpher-bellied Flycatcher, the Zone-tailed Hawk, the Pygmy Nuthatch and the Greater Pewee. The mountain crests call to the Golden-crowned Kinglet, the Red Crossbill and the Golden Eagle.